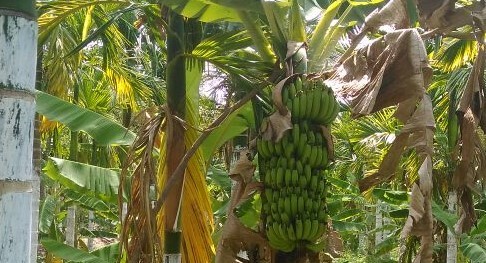 “Earlier I had G9 variety banana but now I am growing yelakki banana. The later has higher selling price and demand is good all the year round. Also I could see more disease in G9 variety so changed to yelakki banana. Moreover selling price of yelakki is more than G9 variety,” shares Mr. Srikantamurthy N. Banana and arecanut are grown as intercrops in his farm. The farm is located in Suttur village, Mysore district, Karnataka. 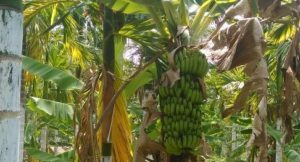 Banana and arecanut is cultivated in 5.5 acre area fenced with teak and silver oak and in another 2acre coconut, sapato and guava are cultivated. Additional 2 acre has Nilgiri trees and paddy in 1 acre. 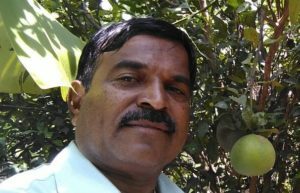 “Besides these plantation I have grown few trees of pomegranate, gooseberry, betel leaves, jackfruit, jamoon, kokum, Syzygium jambos etc. More the trees better is the overall growth of the farm. Three months back I have grown 700 pepper grafts supported by teak and silver oak. The grafts were sourced from Kodagu district,” he adds. All trees are fruiting giving add on income to the farmer who primarily earns from arecanut and banana. Mix of chemical and zero budget farming is practiced in the farm. “I began the cultivation with chemical agri inputs but now gradually I am increasing use of cow and farm waste based manure. As I do not have cows in the farm this year I bought 43 tractor loads of cattle manure. It costs Rs. 2000/tractor load including transportation, loading and unloading. I have dug a manure pit. All farm waste is put into the manure pit and water is sprayed on the waste. Later crystal salt (edible salt) is added on the farm waste and once again it is watered. After 6 months or 1 year it decomposes into manure,” he states. Approximately 600 banana plants are transplanted per acre in the farm. In all there are 3000 banana plants. Speaking on banana cultivation process, Mr. Srikantamuruthy says, “Soil testing is done once in a year at Krishi Vigyan Kendra without fail. According to the soil report we add the nutrients or chemicals. Like we add gypsum if it is less. Everything is done under their guidance of agricultural officers. After the banana variety is selected healthy sapling are purchased from KVK or other nursery. 100-200 saplings are soaked in chloroflourifides solution for 5 minutes and then dipped in cow dung solution. Prior to this pits are dug maintaining the spacing of 6 feet in case of monocropping while 9 feet in case of intercroppong. Row-row distance is 8 feet in either case. Mix of soil and cow dung is added in the pit, the saplings are transplanted and pits are covered with the soil. 6-8 neem granules are left on the top soil near the sapling to keep it safe from pest attack. 2-3 gram cake/plant is used.” Along with neem granules, neem oil is also sprayed. “We try neem oil extensively over chemical pesticides as preventive measure to control the pest.” Banana saplings are attacked by suli rog (leaves twist) and caterpillar disease (eats leaves). Each parent plant gets 4-5 suckers. “We look for healthy sucker and cut the remaining suckers thus post harvesting the mother banana plant is left as it is to provide the food to the healthy sucker and the same crop cycle of one year is repeated. In this way, we can harvest banana 4-5 times from the same plant. Later the entire plant is cut and new sapling is planted,” elucidates Mr. Srikantamurthy. Banana waste is decomposed to make farm yard manure. Entire farm produce is sold at HOPCOMS, Mysore. “I am member of HOPCOMS, Mysore. Only disadvantage selling the produce to them is that they ask for specific quantity. If excess then the entire produce is sent back therefore I prefer selling the produce to traders even if it Rs. 1 less than HOPCOMS price. Reason being, traders only harvest, load, unload and transport the stock unlike HOPCOMS,” he informs. He looks for more avenues for selling. 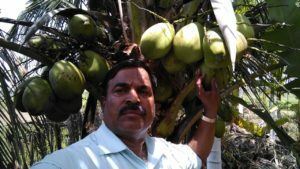 Mr. Srikantamurthy wants to diversify into dairy, goat and pig farming however he is not able to take his plans forward due to lack of labours. Therefore he shall continue his present operations. “Farming will be profitable only when farm owner is a farmer himself. His everyday active involvement is must for the farm growth. With willingness and genuine interest only farming would be a profitable venture!” he signs off.